Last year NFC winners New York Giants won the Super Bowl. Within the context of the Super Bowl Indicator this meant that the stock market should have declined for 2012. However it finished up on 2011′s close. So it was not such a good indicator as it was in for 2011. 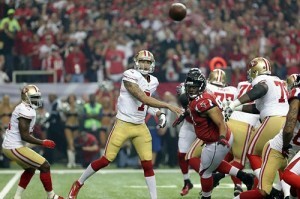 This year we have the Baltimore Ravens (AFC) vs San Fransisco 49ers (NFC) for Super Bowl XLVII (47). Therefore, a 49ers win will suggest a decline and a Ravens win will lead to a market climb. As always take it with a pinch of salt but there is statistical evidence to suggest that following this method, if you like, is profitable. Either way, enjoy the Super Bowl 2013!